Best Women’s Hair Loss Treatments in Leeds, Liverpool, London, Manchester, Newcastle, Nottingham and Sheffield. Hair loss is not just a male problem; many women also suffer from a receding hair line and hair thinning and whilst it is generally accepted that many men lose their hair, it is still seen as taboo and embarrassing for many women causing great psychological and emotional for many of those affected. Many factors can cause female hair loss including genetics, stress and hormone imbalances and whilst some are reversible, unfortunately, sometimes female hair loss is permanent. Nu Hair Clinic offers a range of surgical procedures to treat hair loss. This innovative method of hair transplant takes individual hair follicles from the nape of the neck (donor area) and transplants them into the area of thinning/ baldness. It is a relatively new technique with only a small number of surgeons being able to perform it in the UK. At Nu Hair, we have some of the best surgeons in the UK who can perform this procedure. This option is sometimes preferable for those who are concerned about visible scarring that can be encountered with other methods, or for those clients who intend to have very short hairstyles. As each individual follicular unit is taken independently, the process is quite labour intensive and the amount taken for the procedure will vary widely depending on the area to be treated and hair density. We generally recommend that the surgery takes place in sessions over a number of days. This ensures that the Surgeon and his team can stay focused on this intricate work. Results are visible immediately; however the full effect will not be achieved until approximately 6 -12 months after the transplant. Nu Hair Clinic offers the best Follicular Unit Strip (FUSS) for women in Liverpool, London, Manchester, Manchester and Leeds. 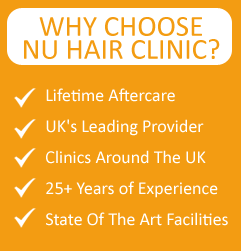 Nu Hair Clinic prides itself on being the best group of hair loss clinics with locations in London, Manchester, Nottingham and Leeds. We offer a full range of hair loss treatments across the UK, depending on your individual needs and preferences. We offer the best hair loss surgeries and best non surgical hair loss treatments in the UK.